In late 2007 SciFi channel broadcasted a new TV show called Flash Gordon. Flash Gordon the TV show was loosely based around the original 1980 film staring Brian Blessed and Timothy Dalton. The TV show wasn't a success and SFX described episode 3 as "possibly the worst episode of anything, ever" I however really did like the show and was disappointed when it was cancelled. During the short lived series, Flash Gordon would travel to an alien world called Mongo to try and find his missing father but during episode 15 as Flash was walking through the alien markets, I noticed something quite spectacular. Mr Singh on Mongo. 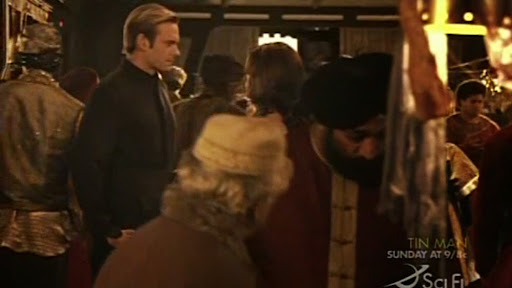 Now the Singh on Mongo is obviously an extra but in the context of the show it's mind blowing seeing a Sikh in another galaxy. Something that's probably never even been noticed by the producers Robert Halmi jr and Robert Halmi Sr, but it's certainly one of the many inspirations for setting up Look! A Singh! In the first place. The new Star Wars movie will be released next December... Fingers crossed!